TWER (once again) needs your help to maintain the quality of vintage Auburn shirts to which Alice has grown accustomed. Won't you please give? Because everyday I get emails that make me think that I actually might be doing something right, something different, something that makes people who live and love this Auburn life type [caps lock] “KEEP IT UP,” something that can provide the means necessary to keep it up, something folks don’t want to lose, something that over the course of 3,000 posts has become Something. As fate would have it, the decision to actively seek direct, regular support from our readers was made just before being informed by our web hosting company that in terms of traffic we were on the verge of crowding the sites sharing our server into oblivion like so many absorbed twins, and would therefore have to upgrade to a more exclusive club. Starting in April, the amount of cash that kept the lights on for a year will now only do so for a month. Thank you for your past and hopefully future support. It means more than you know. Let’s War Eagle forever. OK, folks, it’s time to call each other out on this. I am not only an unpaid contributor to TWER .. I am an avid reader. I hold no aspirations of becoming a paid contributor. The taxpayers of Alabama handle that, through my Auburn University salary. But let’s all admit it. We like getting our stuff for free on the Web. And if someone starts talking about paying for content, we dump that site and search for a better ride. Where TWER is concerned, however, we do need to show some loyalty in the form of a monthly contribution. Without Jeremy, we would not know the Auburn connections of folks who aren’t named Tim Cook or Octavia Spencer. And I would not have known that one of Paul Finebaum’s first times being interviewed was in The Plainsman the year I was editor! Stuff like this adds shading and depth to our Auburn memories. We support book publishers and iPhone apps. Let’s afford the same courtesy to TWER. Don’t you dare fight for your right to leave Jeremy in the lurch and continue to enjoy a free ride. I just clicked. Please do the same. I was the first to comment on the post last April, but it appears Dr. Carvalho has beat me this time. I had another $5/mo subscription to a podcast that I have canceled, and am now spending that $5 here. And it’s a $5 well spent. There are plenty of rah-rah idiots on the Internet for every school and team. But TWER is insightful and interesting and uniquely Auburn. Support their great work! It would be terrible if TWER shut down due to lack of funding, I look at it daily and it gives me so much insight and history into the university and town that I love so much. Contributions coming from me in August (post-graduation!) I can’t do much but i’m sure there are folks out there who can do plenty.. So help out people. Jeremy, I will try to make a substantial donation in a few days. Lots of $$s going out this week but I have posted your message in my AU Fans FB group. I hope it can get you more donations Cuz. Very proud of the work you do and thanks for being there for the Auburn Family. WAR EAGLE and LONG LIVE TWER!!! Any chance we will see another round of tshirts? I didn’t et the chance to buy one before and think they look swell. I donated just so it will show WAREAGLE on my billing statement! A nice surprise reminder when I open my credit card bill. Don’t be a bammer, donate! War Eagle! Jeremy was a tremendous help as I went through the days of tornado relief in Tuscaloosa and the time I traveled the state working afterward. He provided some of the best coverage of what was going on with Toomer’s for Tuscaloosa while I was still with them but more than that he was a friend to talk to in an unbelievably trying time. Jeremy might not realize that but it is true. Signing up for a monthly subscription and urging everyone else to! 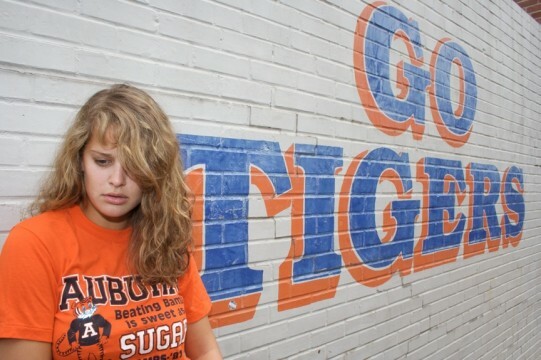 The is THE BEST Auburn site for real Auburn news. Never properly thanked you and now I know how. I’m with Auburn Elvis here. I just donated and was happy to do so. The insight this site provides on Auburn history is unmatched and it would be a tragedy to lose such a great resource for the Auburn family. I would also be interested in purchasing a t-shirt if there was another round and chance to buy. WDE and keep up the great work!! This site is terrific….especially for us that graduated way back in the 70’s. I just ante-ed up. Keep it rolling….love the pictures and videos. Is there an address where I can send a check instead? We DO have plenty of T-shirts left over (S-XL) go to the contact page and email what you’d like and we can get it to you. There are also some of the older styles (“Its pronounced Jordan” “Dye Hard” and “Sullivan Beasley” ) sizes are limited if interested Email us for more info. Love your articles and memories you reufresh me of. Just joined in for contribution monthly. I too was a student in 70’s and 80’s. Have only 1 degree so far. May return in future. Keep up the AUsome work that you do. Thanks and War Eagle.